Celebrate Camp Farnsworth's history and 110th Birthday with your Girl Scout sisters and camp alums at this fun weekend event. Tour camp, participate in a flag ceremony, take a canoe ride, swim in the pool, or try out the new Camp Farnsworth History Patch program! 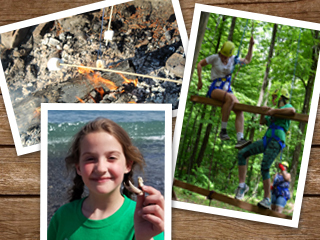 Includes activities for all ages, ceremonies to celebrate the history of camp, and decade photo sessions for those who attended camp in the past. Enjoy meals in the dining hall and a campfire to close out the day. Register for a day of fun! Overnight accommodations at Camp Farnsworth Friday 7 pm - Saturday 8 am. Accommodations are rustic camp tents or cabins and do not have electricity. Overnight accommodations at Camp Farnsworth Saturday 8 pm - Sunday 9 am. Accommodations are rustic camp tents or cabins and do not have electricity.